Q1. Can I take a free trial lesson? Q2. I haven't studied Japanese at all. Can I still apply for one of your beginner classes? Q3. How many sessions do you have per course? Q4. How long is each lesson? Q5. Is your teacher a native Japanese speaker? Q6. How much is tuition? Q7. Can I make a partial payment at the beginning and pay the rest at the end of the session? Q8. What forms of payment do you accept (i.e. Cash, Credit Cards, Check)? Q9. What is your cancellation policy? Q10. How many students do you have in a classroom? Q11. Can I receive a certificate? Q12. Is the cost of a textbook included in the tuition? Q13. Is there any official Japanese proficiency test? Q14. Do you have any class for the preparation of official Japanese proficiency test? Sorry but we don't have any group lessons now. Yes, you can take one trial lesson. If you are interested in studying Japanese language, please feel free to inform us about it. No problem. I teach both HIRAGANA & KATAKANA Japanese alphabets. You're more than welcome to come on the first day of the class (free trial lesson). It varies depending on each class. One course is about 4-10 sessions. The lessons are 50 minutes each. There is no registration fee. You simply pay for your tuition only. Tuition depends on the class. Please see our course listing. 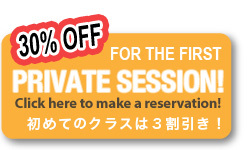 Sorry, you must pay for the course in full by the second session, if you wish to continue. We only accept cash currently. I offer the first class free (This is a free trial lesson.). If you don't pay in full by the 2nd session, you cannot participate in the class. Please do not forget to bring your payment. Your tuition is non-refundable. The maximum number of students is five to ten. Yes, you can. You will receive a certificate after you complete one course with 100% attendance. No, it is not included. There are several places you can buy the text book. Yes, here are two official Japanese proficiency tests. JESS and J-TEST. Q14. Do you have any class for for the preparation of official Japanese proficiency test? Sorry, we don't have it now, but I will definitely consider it if the demand is high.